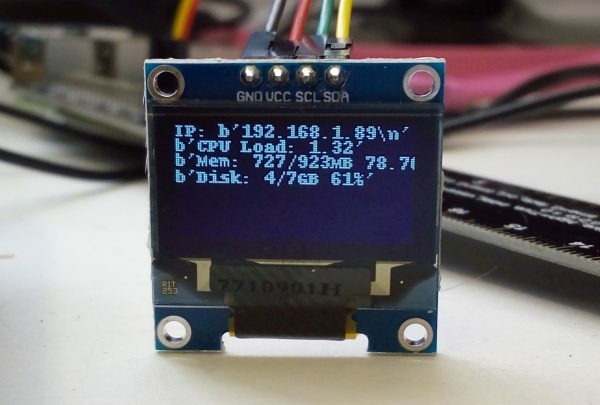 Working With an SSD1306 0.96″ OLED Display on Raspberry Pi @Raspberry_Pi #PiDay #RaspberryPi « Adafruit Industries – Makers, hackers, artists, designers and engineers! I’m always on the lookout for cheap electronics on eBay and AliExpress. Following on from my previous tutorial on HD44780 screens, this time, I found a small OLED display. I bought one of these from eBay for less than £5 plus postage. It is a 0.96″, 128×64 pixel OLED display. These things are really tiny, but useful if you’re after something to display status information. They run from the I2C bus, this one using address 0x3C. This means that all the other addresses are available for you to use to get I2C sensor readings from or to drive other displays. You can even change the address on these displays to allow you to use multiple of the same device.